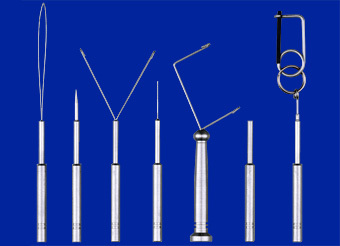 Fly tying tools made from stainless steel. This 7-piece tool set is made entirely in Germany from stainless steel (VA-type). We assemble all the parts in our own shop, which requires high precision especially when mounting the bearing inside the handle of the hackle pliers. Any mistake there would substantially impair the function of this tool. These hackle pliers combine new technical solutions and perfect function. 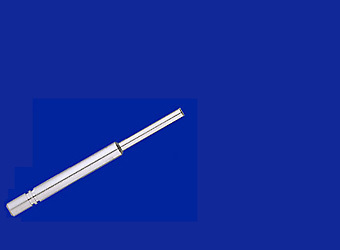 We also offer you a new tool I´ll call a dubbing rasp for the moment because it resembles a tiny rasp while serving to pick up tiny portions of dubbing out of dispensers with small holes. Tie your own flies with a perfect tool set. These Hackle Pliers are based on the well known Dorin pattern. The spring, however, is made to measure especially for these pliers and is unsurpassed in grip, being at the same time easy on your hackle, cdc or further material. The pliers are connected to the grip in a way that permits them to rotate freely. Grip, bearing, and joints are also precision made from stainless steel. When comparing it to other whip finishers you will see that - unlike other products - our whipfinisher has both hooks facing to the same side. Once you´ve tried it, you will realize that it makes your tying much easier. Not only picking up your tying thread is much simpler, but also holding it during rotation. You needn´t juggle to keep your thread inside the hooks while you apply your whip finish. This tool comes in two versions, a righthanded and a lefthanded one. Check it out on my video about using the whip finisher. The bodkin is the only tool in our new series not entirely made from stainless steel. 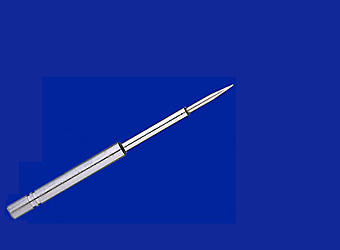 The grip holds a chrome-plated hardened point normally used in the manufacture of compasses for drawing. This part has a higher resistance to abrasion than a point machined from stainless steel could have. 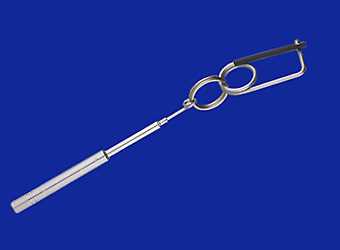 It can be used universally, not just to tease out some dubbing, but also to open a hook´s eye that has taken an accidental drop of head cement or superglue. I also use it on flies tied using two-component adhesives; in this case you should make sure you clean your bodkin before the resin hardens!!! This tool should be used with care! 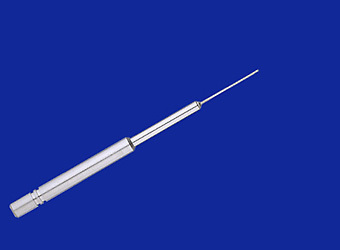 The fine needle has many fine barbs that help you to extract small quantities of dubbing from a bag or from a dispenser with only a small opening - more conveniently than using pincers. But take care, the needle is pointed and if you happen to stick it into your finger, the barbs are very annoying! I´ve called it a rasp because that´s what it resembles when you look at a magnified image. As you see, here also both hooks face in the same direction. This will enable you to completely close the lower end of your dubbing loop. Check out my video to show you how. This way you can securely hold even extremely fine materials, e.g. CDC-fibers, over the entire length of you dubbing loop. Many tiers like to secure their work after completion of part of the pattern by a half hitch. That´s a very simple knot using up little thread but preventing the material you have just applied from coming undone. 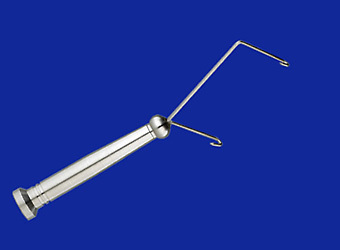 This tool is not only useful to tie half hitches but also to compress turns of material on your hook shank, e.g. deer hair for "irresistible" bodies. Be it that those bobbin tubes are just so darn small, be it that your eyes cause you trouble threading your bobbin - this threader will prove very useful.